Welcome to Parenthood: Five Months | Kris Johnson's Blog…sort of. I can personally attest to the Stinky Feet……. Whoooooooo Wheeeeeeeeee, mom and I didn’t believe it when you and Lola were telling us that he had stinky feet. I do believe that the words “but babies feet don’t stink!” were uttered, until one after the other we went to nibble on his toes. Several ill-concealed gags later we were irreversibly proven wrong. 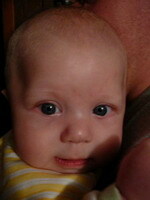 As to the power of those blue eyes and soft, cooing voice….yup.